The regular restoration, from September 5 to December 5, was made in line with procedure, Major General Nguyen Van Cuong, head of the mausoleum’s management board, reported to Prime Minister Nguyen Xuan Phuc on December 5. The body of President Ho Chi Minh has been kept in optimal condition while the facilities at the mausoleum have been upgraded. During the restoration, the management board ensured security and order at the mausoleum, Ba Dinh Square and anearby monument to heroic martyrs. The board also worked with other forces to serve delegations of National Assembly deputies during the parliament’s second session and foreign leaders visiting the mausoleum, Cuong said. 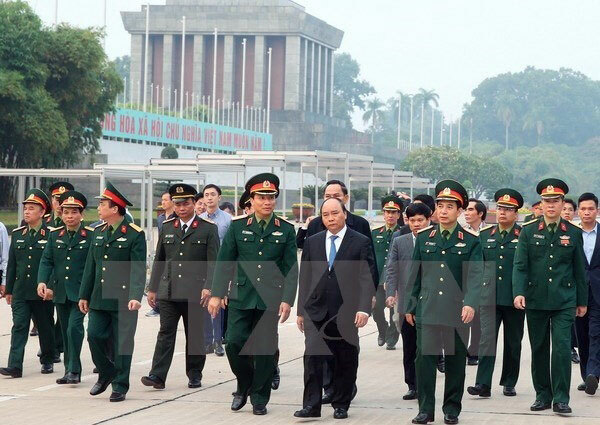 PM Phuc highlighted the special importance of the Ho Chi Minh Mausoleum and the protection of the late leader’s body. He asked the management board to coordinate with relevant agencies to ensure the absolute security of the mausoleum whilst remaining ready under all circumstances and serving visitors. The Ho Chi Minh Mausoleum is an important landmark of the capital city and serves as a monument to the political and social history of Vietnam. Ho Chi Minh was embalmed after passing away on September 2, 1969. The granite mausoleum, modelled after Lenin’s tomb in Moscow, was built in from 1973 to 1975 with materials donated by people from all over the country. It was opened to the public on August 29, 1975./.